I’ve received so many requests for these energy bars that I figured it was high time I post the recipe! This recipe is adapted from Rebecca Katz’s in “The Cancer Fighting Kitchen”. I started making them for a client because they really are the perfect snack for waiting around and during chemo treatments. But, it turns out that they’re a perfect snack for everyone! My husband, a marathoner, swears by them and has me make a batch before every race. I snacked on these throughout my pregnancy (awesome to stave off that 1st trimester nausea) and they even made it into the delivery room with me. These are also great for kids…they love them! These pack a nutritional punch. Dates are natural energy boosters with loads of potassium and dietary fiber. Dried apricots are rich in beta-carotene, an anti-oxidant vital for the healthy growth of bones, skin, hair, teeth and eyes. They are also high in calcium and magnesium. Almonds and walnuts (nuts in general, really) are a great source of protein and are high in essential fatty acids and vitamin E.
Now, let’s get to that recipe! 1. Heat oven to 350 degrees and spread nuts on a baking sheet with lined with parchment paper. Toast in oven for 7-10 minutes until they smell nutty and are slightly browned. Take good care in this step since nuts are notorious for burning easily! 2. Combine the flours, flax seeds, salt, baking powder, baking soda and oats and process in a food processor for 5 seconds. Add the nuts and process for another 5-10 seconds until they are coarsely chopped. Add the oats and dried fruit and process until all is well mixed together. Transfer mixture to a bowl. 3.In another bowl, beat egg and whisk in maple syrup and vanilla extract. Add to nut mixture and combine well, breaking up any really solid parts. Using your hands is the best way to do this! Then add chocolate chips. 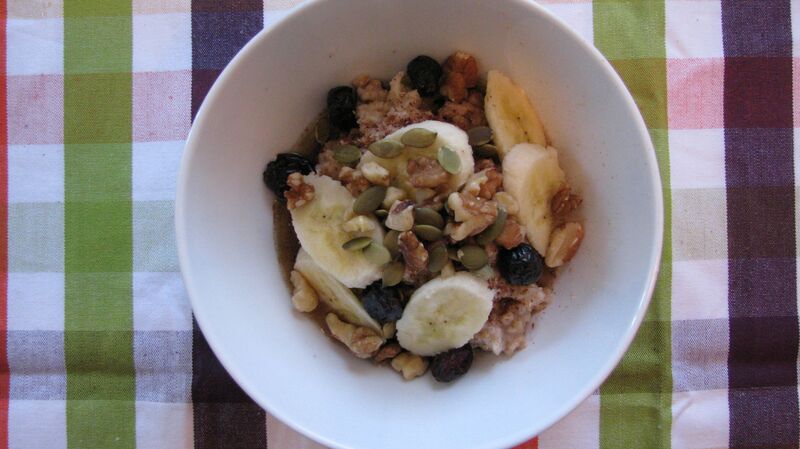 *If you use Bob’s Red Mill Gluten Free Oats, this recipe is completely Gluten-Free. If gluten is not an issue then any rolled oats are OK and you can even substitute the flours for ¼ C spelt flour.